Strange, A.M, O'Donnell, B., Gamboa, D., Parks, B., & Perla, C. 2013. 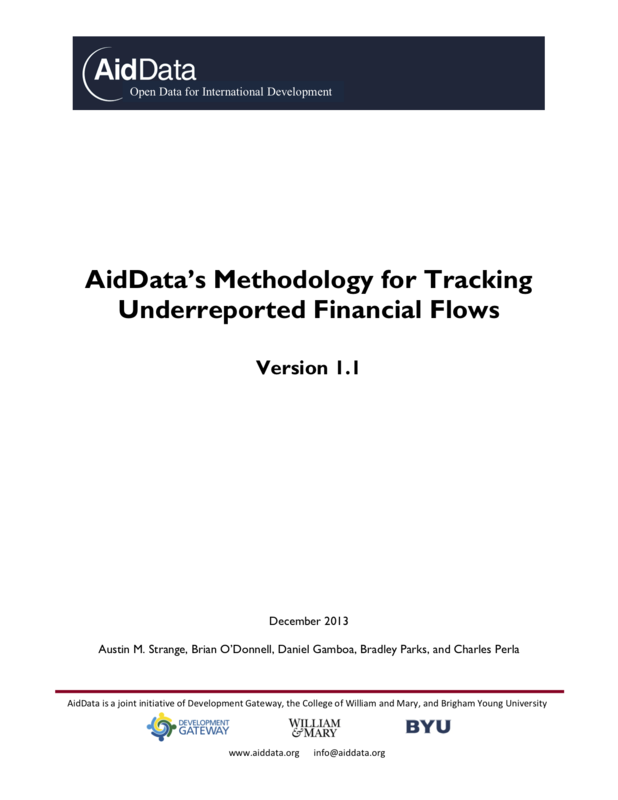 AidData's Methodology for Tracking Underreported Financial Flows, Version 1.1. Williamsburg, VA: AidData at William & Mary. AidData has developed a set of open source data collection methods to track project-level data on suppliers of official finance who do not participate in global reporting systems. This codebook outlines the version 1.1 set of TUFF procedures that have been developed, tested, refined, and implemented by AidData researchers and affiliated faculty at the College of William & Mary and Brigham Young University. In the first iteration of this codebook, AidData's Media-Based Data Collection Methodology, Version 1.0, we referred to our data collection procedures as a “media-based data collection” (MBDC) methodology. The term “media-based” was misleading, as the methodology does not rely exclusively on media reports; rather, media reports are used only as a departure point, and are supplemented with case studies undertaken by scholars and non-governmental organizations, project inventories supplied through Chinese embassy websites, and grants and loan data published by recipient governments. In the interest of providing greater clarity, we now refer to our methodology for systematically gathering open source development finance information as the Tracking Underreported Financial Flows (TUFF) methodology. This codebook outlines the set of TUFF procedures that have been developed, tested, refined, and implemented by AidData staff and affiliated faculty at the College of William & Mary and Brigham Young University. We initially employed these methods to achieve a specific objective: documenting the known universe of Chinese development finance projects in Africa from 2000 to 2011. However, the data collection procedures outlined in this codebook can be applied to any supplier of development finance that does not publish its official, project-level data.